Alumni Picnic – September 16th! 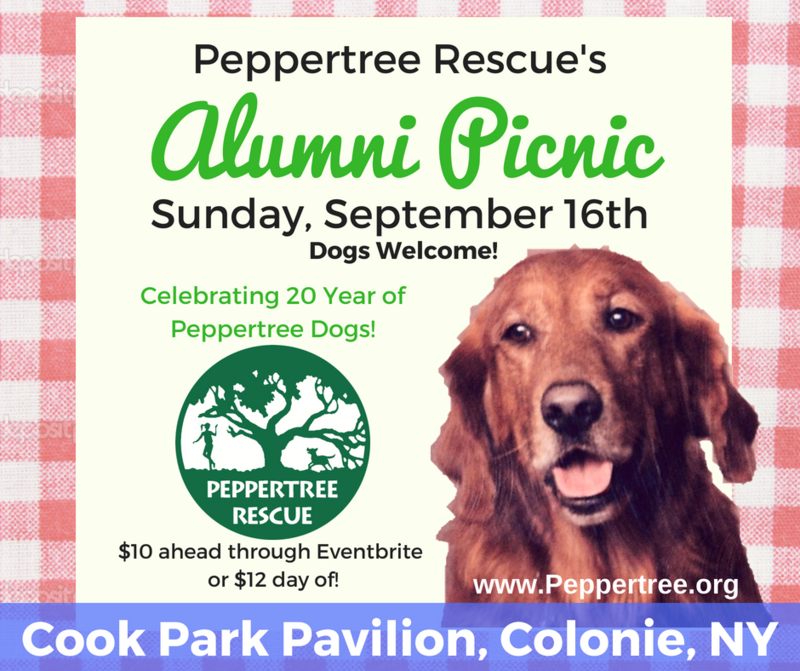 Join us for our 11th Annual Alumni Picnic at Cook Park Pavilion in Colonie, NY on Sunday, September 16th, from noon to 3pm. Everyone is welcome, whether you are a Peppertree adopter, supporter, or just like good food and hanging out with your dog, this is not limited to our alumni. Tickets are $10 ahead through Eventbrite, or $12 day of. It is $5 for children and we will still offer the family package of $25 for two adults and two children. We will be celebrating 20 years of Peppertree with hamburgers, hot dogs, veggie burgers, Chef Joe’s Chicken, assorted picnic salads and birthday cupcakes for dessert! We will have an obstacle course sponsored by Good Choice Dog Training, and Old Dogs New Tricks will be on hand to conduct an AKC Canine Good Citizen evaluation, your dog could leave with a title! E-mail Alissa at OldDogsNewTricksDogTraining@yahoo.com for more details. Cook Park Pavilion is located off Shambrook Parkway in Colonie, NY. Do I have to have a Peppertree Dog to attend? No! The more the merrier, all friendly dogs (and people) are welcome to join us. You and your dog are welcome! We ask dogs not be on flexi-leads or retractable leashes, and while there is picnic seating you are welcome to bring a chair of your own. If you buy ahead through Eventbrite they will issue a refund as long as it is more then 7 days prior to the event, unfortunately for food estimate purposes we cannot refund any closer to the event.